NeoMetrix Technologies recently introduced the latest version of 2014 SP1 of SpaceClaim Engineer 3D direct modeling software. With a new module in this latest version, the users will be able to directly adjust STL and CAD files as well as patching up models for 3D printing. STL Prep for 3D Printing is applied to evaluate and clean intersections; making sure that the model is water-resistant; and fix inverted normals, intersecting facets and other problems which result in print failures. 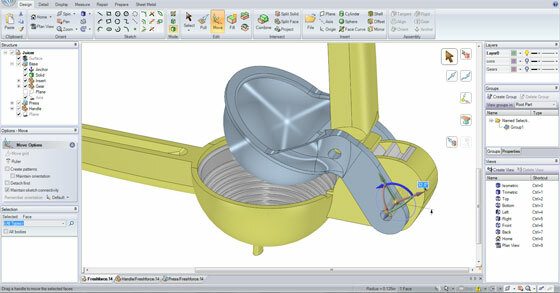 Being able to directly edit STL files, the users can carve the model in various sections with the selection of a plane, elimination of minute features, breaking up the STL for multi-material printing, allocating color variations, and deconstructing the part and/or organizing features into superior positions for having more optimized 3D print. The Users also get the ability to combine an STL with another STL or a solid, solidify an STL to make the potency better, generate connecting features, or make options like overmolds. Print can be optimized by using SpaceClaim STL Prep’s shell tool. Besides, it can save on material, produce offset parts, or identify diversified interior regions of a part. STL Prep for 3D Printing can also minimize the sizes of the file to make printer performance superior with decimation. SpaceClaim STL Prep provides support for several file Formats as well as save & export STL files from SpaceClaim directly to the printer for efficient printing process. STL Prep for 3D Printing is compatible with 2D files and other faceted formats like OBJ, cgr, & AMF.